The book “Wain-Roy and the Invention of the Backhoe” is available now and can be ordered direct from www.originalbackhoe.com or on Amazon. I have worked in the Construction Equipment Industry for over a third of a century. A good portion of that time, I was the Director of Engineering for Wain-Roy Inc., and then Woods Equipment Company of Hubbardston and Gardner, Mass., where the original backhoe was invented and first manufactured. As such, I was fortunate to work with some of the original Wain-Roy men and women who played a large role in developing the backhoe and promoting its widespread use. Prior to Wain-Roy, I worked as Principal Engineer for Komatsu, which was previously Komatsu-Dresser, Dresser and International Harvester Payline Division, located in Libertyville, Ill. This was the original Frank G. Hough Company where the first hydraulic wheel loaders where invented and manufactured. I worked with people there who were involved in the engineering work that attached some of the first Wain-Roy backhoes to Hough Payloaders, thus creating the first tractor loader backhoes (TLB's). I was surprised to discover that two companies were accredited with the invention and development of the backhoe, and the tractor loader backhoe. Several books, magazines and websites state or imply that J.I. Case on the U.S. side, and JCB of the United Kingdom were the first to develop the backhoe. 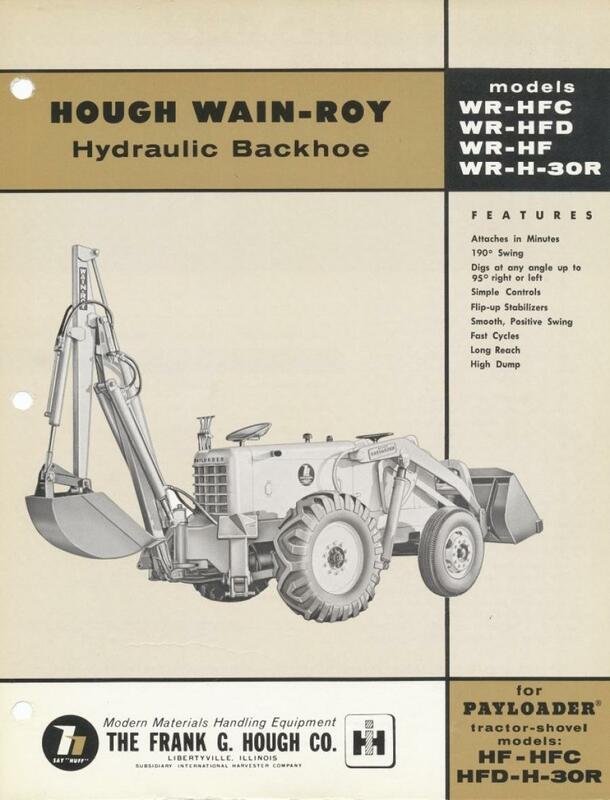 In my years of work at Wain-Roy, I learned that it was the employees of Wain-Roy who were the original inventors of the first backhoe, the first all-hydraulic digger, and the creation of the first tractor loader backhoe. A search of patents shows a clear chronology of invention and innovation lead by the people of the Wain-Roy Corporation. They invented the first all-hydraulic digger, the first swing frame, the first stabilizing outriggers, the first reversible seat, and many other major first developments, including the first thumb. Having known some of the key employees at both Wain-Roy and the Frank G. Hough Company, and having researched the patents, I felt that it was my important duty to make sure that this story was told, and the history behind it corrected. I have worked with many of the key people mentioned in this book. I knew Roy Handy and Ken Russell when they were alive. 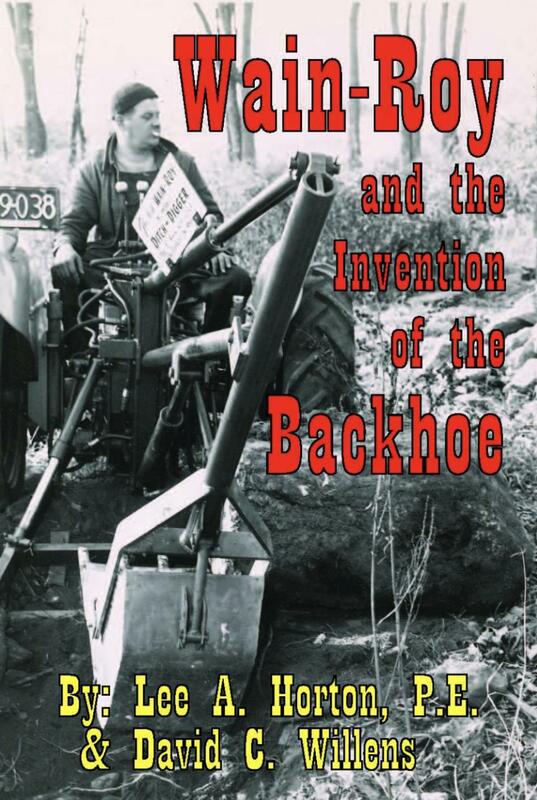 During the writing of this book I was able to interview some of the other key people involved in the invention of the backhoe such as Carroll Arnold, Roger Vaughan, Charlie Clark and Edwin Holopainen. Their personal accounts of the backhoe story bring a dimension of reality to the rich history long forgotten. My goal in writing this book is that history is corrected, and the invention of the backhoe, the first tractor loader backhoe, and the first hydraulic digger is properly accredited to Vaino Holopainen, Roy Handy and the people of Wain-Roy Corporation, and that they receive the full credit that they deserve. I am sure that the surrounding related history of the company and the town of Hubbardston will be of interest to people in the Construction Equipment Industry and others alike.